It’s hard to believe but the college school year will be coming to a close in just a couple of months. The last few months can be particularly stressful with finals and burnout, not to mention the temptation of warm weather. Almost everyone is ready for summer. But before the ultimate vacation begins, most people have the same issue to worry about — moving out. Moving out is an additional stress that comes along at the end of the semester. What things do you need for the summer? What can be packed away until fall? And where will everything go? It’s important you begin thinking about all this before the year comes to a close and you’re struggling to find a place to store your things. Many college students tend to store their belongings in a storage unit when they’re away from school. This is a great option that makes moving easier. Below are some things you should look into today when considering a storage unit facility. 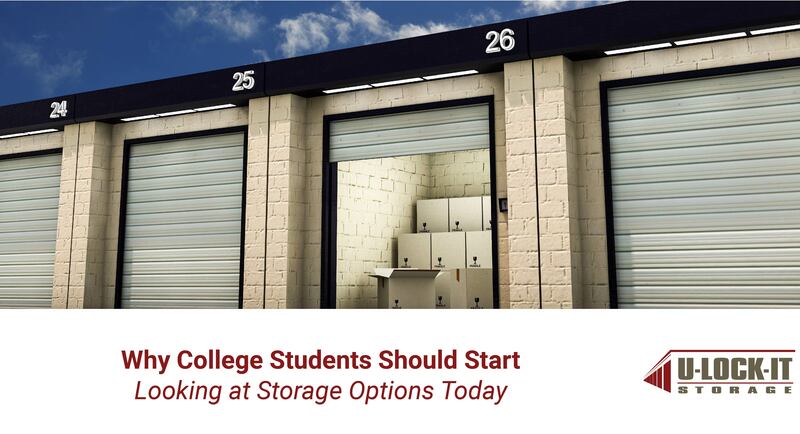 Is the storage unit facility you’re considering in close proximity to your college campus? You’ll be in charge of transporting your belongings to and eventually from the unit (whether you hire someone or choose to go it alone), so you won’t want a location that’s too far from your campus. Are their storage unit options in your price range? Be sure to check their month-to-month rates for the unit you’re considering and ask if they have any special deals for college students. Also, consider the additional costs of locks and packing materials to keep items protected in the unit. Is the storage unit facility in a safe area. You don’t want to leave your belongings in a place that doesn’t feel secure. Does this storage facility implement safety features in order to ensure the protection of people’s belongings? Visit it before you commit to keeping your belongings there. Does the storage facility have options when it comes to their units? Do you have a number of unit sizes to choose from as well as the option of climate control? You don’t want to rent out a unit that’s much bigger than you need — you’ll end up paying more for unused space. Make sure the facility you choose has what is right for you. U-Lock-It storage has a number of different storage unit options to choose from in a secure location. Consider keeping your belongings with us during the summers between your college semesters.